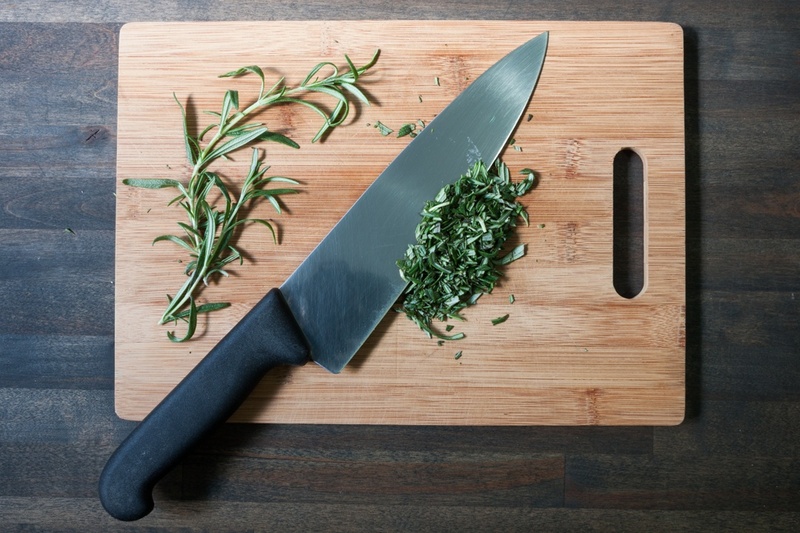 Fresh organic herbs are easy to enjoy on their own, with their leaves of many shapes and sizes, and distinct fragrances that make you want to walk around with a bundle tied to your nose. But it can be hard to keep track of them all, and to figure out how to use them while the tender leaves are still fresh. 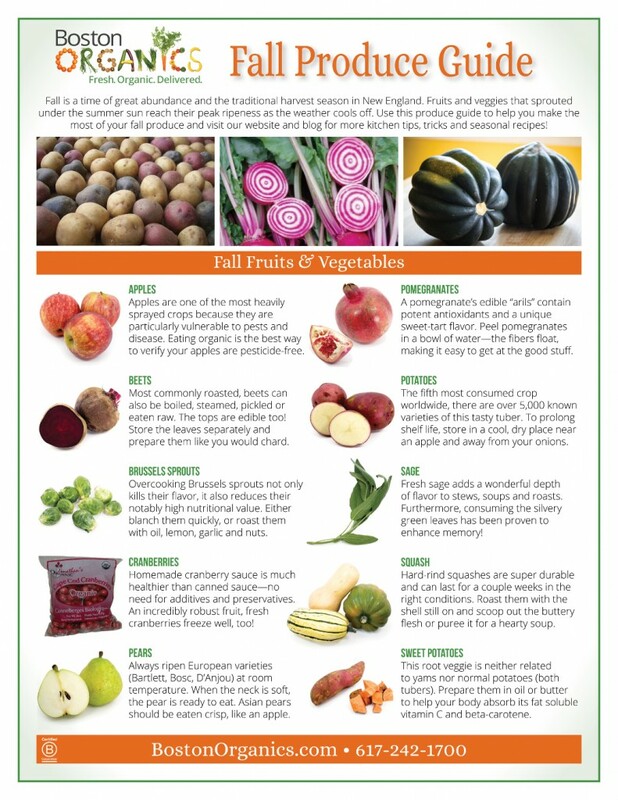 Boston Organics is here to help you keep these flavorful plants straight so you can use them with ease. We're off to a beautiful start this fall. 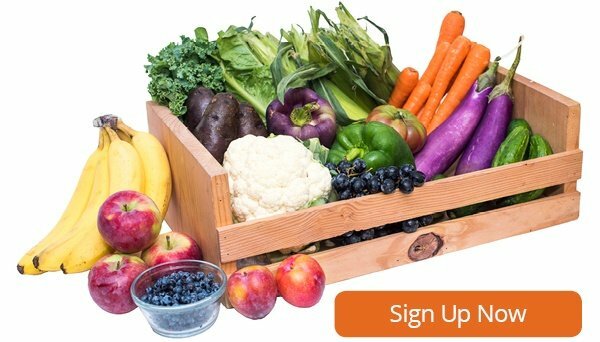 Find out what's harvesting this season and what you can expect in your box over the coming weeks. Mention school lunches to a parent and you’re guaranteed to get an emotional response. We all remember the barely edible “food” that our own school cafeterias served, and while some schools are doing a better job of providing their students with tasty and nutritious lunch options, packing a lunch is still the best way to make sure our kids stay energized and ready to learn all day long. Making healthy lunches for your children also teaches them positive eating habits for the future. But when it comes to school lunches, there’s nothing worse than having your kid throw out a meal that you spent money, time and energy putting together. With junk food more accessible than ever, we want to make sure our kids are eating right when we’re not there. Below are five tips for packing a healthy school lunch that your kids will actually eat. Before it was dubbed America’s “superfood,” kale was an obscure green that could only be found at farmers’ markets, independent health food stores and, of course, at Boston Organics. Kale has become so popular that it’s almost hard to remember a time before it was the ultimate emblem of healthy food. 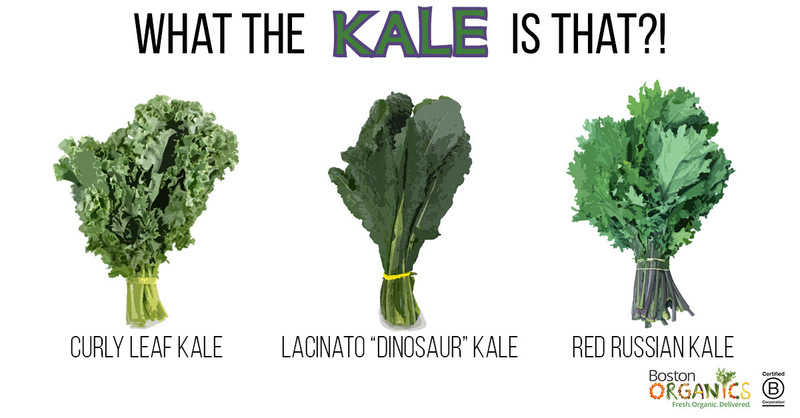 But now that kale is everywhere (even McDonald’s is planning to add kale to their menu), there are so many different kinds of kale out there, it’s hard to keep them all straight. 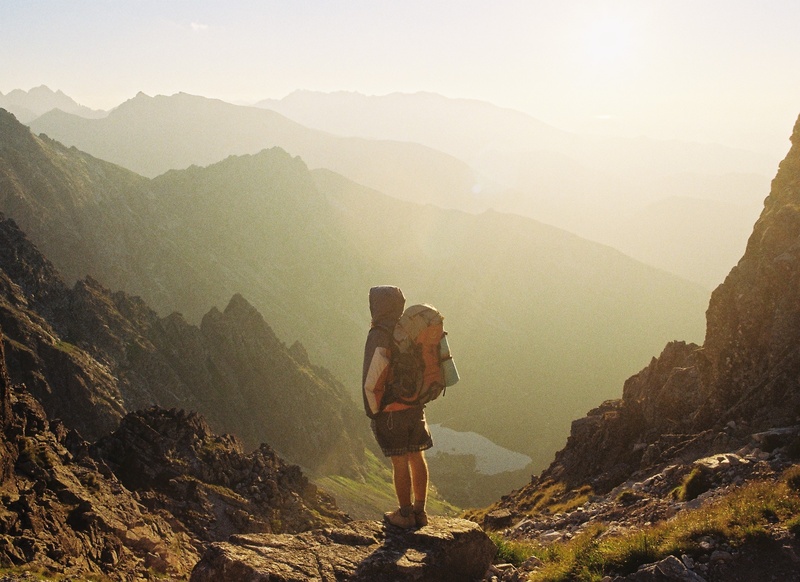 The farther you get from civilization, the closer you feel to the people you’re with. The earlier you wake up, the more energy you seem to have. The more serene it is, the more alive you feel. But there’s one part of camping that just doesn’t add up. We go into the woods to clear our minds and fill our lungs with clean air, but then we fill our stomachs with candy bars and hot dogs. After going through all this trouble to connect to nature, why is traditional camping food so processed and unhealthy? It doesn’t have to be this way. In fact, it’s relatively easy to eat healthy food when camping, as long as you’re conscious about it and plan ahead. Here are a few tips to help you eat healthy in the great outdoors. Scroll down to find our sample menu for a weekend camping trip. 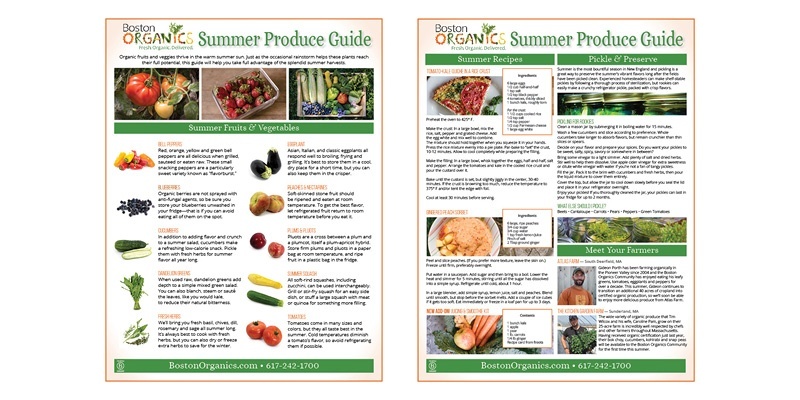 Organic fruits and veggies thrive in the warm summer sun. 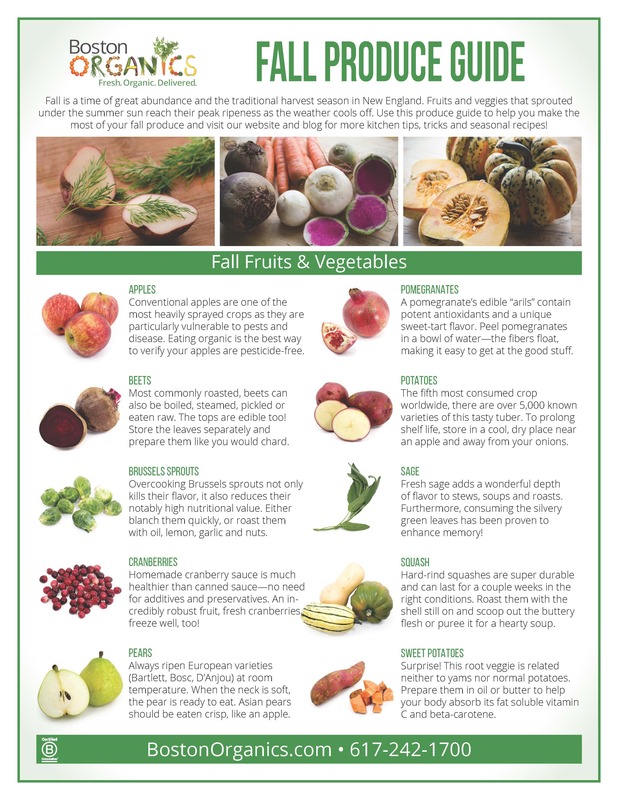 Just as the occasional rainstorm helps these plants reach their full potential, this guide will help you take full advantage of the splendid summer harvests. As the chilly weather thaws, we can feel the growing season begin to kick off in the Northeast. 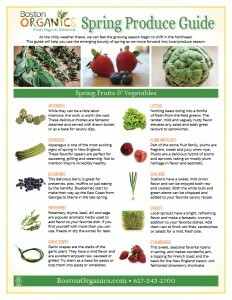 This seasonal produce guide will help you maximize the emerging bounty of spring as we move forward into local produce season. 2014 was an exciting year full of great milestones. 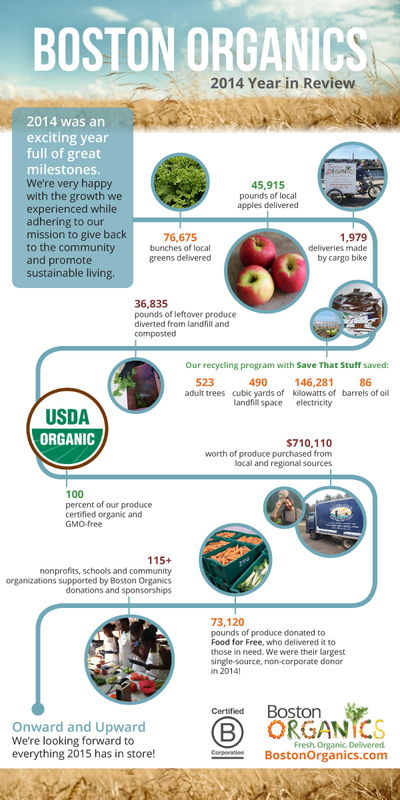 We're very happy with the growth we experienced while adhering to our mission to give back to the community and promote sustainable living. Fall is a time of great abundance and the traditional harvest season in New England. Fruits and veggies that sprouted under the summer sun reach their peak ripeness as the weather cools off. As children we were all taught how important it is to eat our dark green leafy vegetables, but few of us realized just how many kinds of organic leafy greens there are out there!